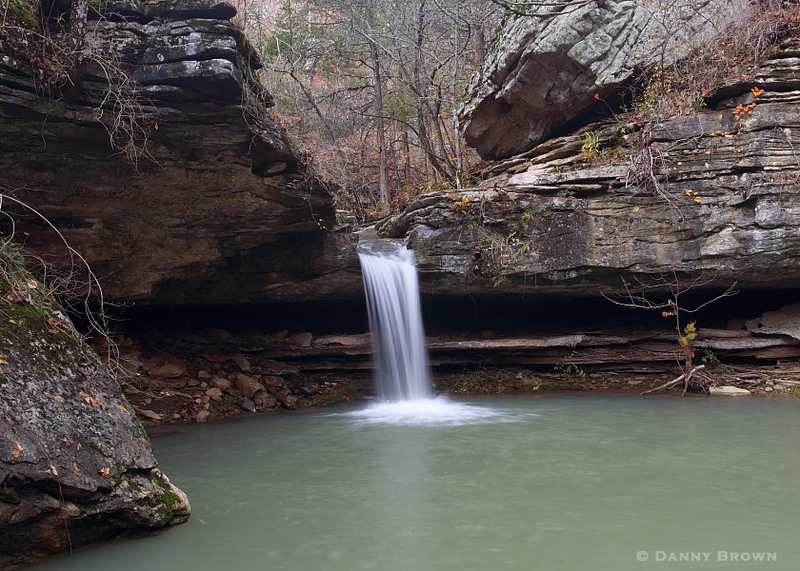 Paige Falls drops into its emerald pool just outside of Compton, Arkansas. By the time Bill and I finished our hike to Hemmed-in Hollow Falls, we were ready to recharge our batteries with a sandwich at JB Trading Co. in nearby Compton. The store makes sandwiches for hikers, campers, and tourists every day and boy are they good! They start with two thick pieces of white bread, and a hearty helping of meat and cheese (I chose bologna). After that you can choose anything to add to the sandwich and we both opted for “everything.” We didn’t even need anything to go along with our homemade sandwiches except for some coffee. When we left the store, we were ready to check out Paige Falls. Paige Falls is only a short hike from a gravel road outside of Compton, the one right across from the volunteer fire station. It is so easy to find, only two miles down the gravel road to a creek crossing and then downstream a couple hundred meters. As you can see from the featured image, it is a beauty! My photo looks more like a winter shot than a fall shot but I still liked it. 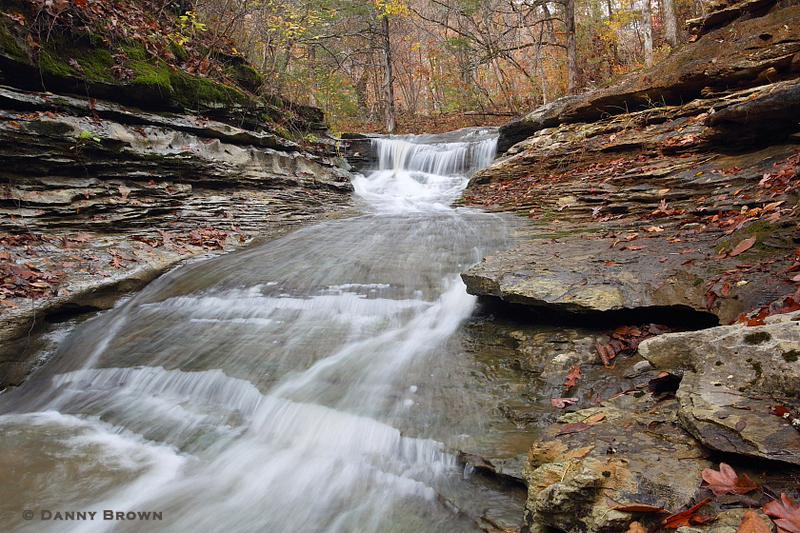 While we were at the falls, we met a geologist hiking with his daughter and he gave us some great tips for our trip to Hawksbill Crag the next day. The couple was just one example of about 30 people we had talked to during the trip up to that point and they were all about as genuine and friendly as a person could ever hope for. Trail hikers are smart enough to leave the ugliness of politics at home for the day and I always appreciate that. There is a nice cascade just upstream from Paige Falls that I photographed as well. It wasn’t anything too spectacular but it was as nice as some waterfalls that I have hiked for miles to see in Missouri. A cascading waterfall just upstream from Paige Falls. I’m not sure if it has a name. Just downstream from Paige Falls is another waterfall, Broadwater Hollow Falls, which is well worth photographing but the sun was finally breaking through the clouds and getting bright so I chose to come back on another day, especially with the promise of another sandwich at JB Trading Co. Ha! We started down Erbie Road out of Compton and it quickly became a boulder strewn trail, much like those I’ve traversed in the mountains of Colorado and no problem for my 4Runner. After creeping along for about four miles I was feeling pretty good. That is when we came to a steep downhill section that appeared to be thick, wet mud (it had been raining for days) with more thick wet mud underneath. I looked at Bill and said, “I really hate to turn around and go back to Compton.” Bill said, “I know man; we have to try it.” So I edged forward in the 4Runner and was immediately sucked in to the ski slope of mud and began sliding with no control down the hill. A moment later, my rear end came around and the slide continued with the vehicle going almost sideways. Steering was completely gone, deep ruts kept tossing us back and forth across the road, and all I could do was occasionally goose the accelerator to at least try to stay on the road. The ditches adjacent to the road/trail were deep mud pits on both sides. I must be living right because we finally came to a stop at the bottom of the mud slope as we ran aground on the familiar terrain of boulders and cobble over a firm surface. I looked at Bill and said, “I can’t believe we made it!” Bill said that if we would have slid off the road, my 4Runner would have simply become a rusting relic in the Arkansas landscape, never to be recovered. I think he might have been correct! After the near disaster, we eventually made it to Erbie Church, the trailhead for Thunder Canyon Falls. We scoped out the area and made plans for a return in the future to make the five-mile hike to the falls and back, including several stream crossings. Trust me, when I return I’ll be coming from the other direction to the Erbie Church! We made it back to Harrison by supper time and headed to a Mexican restaurant for well-deserved margaritas. I suppose we forgot that alcohol is not served in very many Harrison restaurants so we had to settle for iced tea with our Carne Asada. Yuck! The food was good though and we even had Sopapillas to help replenish our stores. America is beautiful. I voted today to keep it that way!